Families have trusted Toufayan to bring them the best tasting, healthies breads possible. Perhaps that’s why our range of flatbreads have proven to be so popular.We bake our flatbreads using only the finest ingredients so they provide a really fresh, delicious taste. They are both light and staisfying, resulting in the best paninis, sandwiches and flatbread pizzas.With 8g of protein, 0mg Cholesterol and 0g Trans Fat, it’s a bread you can feel good about serving. We know your family will love the unbeatable fresh taste and texture of our Toufayan Flatbreads. Hello, i have hearty white flat bread. Is it necessary to be roasted or cooked? Or i can directly eat them with something like omelette? They are good right out of the package! We do like to warm them up a bit, a little heat releases a bit more flavor and increases the softness in the texture. A spin in the microwave with a slightly damp paper towel or a couple of minutes with some oil or butter in the frying pan works well. You can also toast them or bake them for a few minutes. With an omelette, we recommend a little butter in the frying pan, cook on each side for a minute or two until the bread is warm but not too hot. Thanks for your question, Chaitanya, please feel free to comment further! Are your flat breads vegan? I currently have the hearty white and am Converting to a vegan diet and some of the ingredients could go either way. Thanks in advance. Our Hearth Baked Flatbreads aren’t yet certified vegan, however, we don’t use any non-vegan ingredients. While we do use calcium propionate and other ingredients that can be made from vegetable or animal fat, we use only vegetable fat and microbial fermentation. Ingredients: Enriched wheat flour, water, vegetable oil, yeast, soy flour blend, dough conditioner, sugar, wheat gluten, salt, baking powder and calcium propionate (added to maintain freshness). Ingredients: Stone ground whole wheat flour, water, vegetable oil, yeast, soy flour blend, dough conditioner, sugar, wheat gluten, salt, baking powder and calcium propionate (added to maintain freshness). How many inches in diameter are the flatbreads? I like your pita (classic white plain) but it is a bit smaller than what we would ideally like. Hello Daniel and thank you for your interest. Our Hearth Baked Flat Bread is larger than our Hearth Baked Pita, though they are only slightly larger in diameter. Flat Breads are approximately 7″ in diameter, while Pita is 6″. If you’re looking for an even larger bread, you can try our Lavash or our Naan. Both of these breads are very large. There are Multi-Grain and Whole Wheat varieties of Lavash and our Naan is available in Garlic or Original varieties. Please let us know if you try any and what you think of them, or if you have any other questions. Hi. I have a query. Natural flavor used in your products. Does this ingredient undergo processing with ethanol during its own manufacture? My son refuses to eat any other type of bread for his school lunch sandwiches. I had to go 30 miles to the nearest store that sold them until my local grocer (Brookshire’s) started getting them for me. They recently told me they were unable to order them anymore so now I’m back to ordering a case at a time from Albertsons 30 min away. Is there any other way to order online? Thank you for your interest, Jennifer. Toufayan Bakeries ships mainly to distributors who in turn ship to your local supermarkets. At this time, our facilities are not set up to ship individual cases or smaller orders across the nation. Please ask your favorite grocer to add Toufayan Hearth Baked Flat Bread to their inventories or to contact us directly. In the meantime, you may find a map of the country on our where to buy page. From there you can click on your area to see a list of stores in your region that are part of our distributor’s reach. It is up to each individual store manager to stock Toufayan products or not, but those grocers listed on our where to buy page already have the availability to stock our products. The wholesome wheat flatbreads are awesome. I made pizzas using them as the crust and they are sooo filling. Awesome! Hello Steve and thanks for your interest. 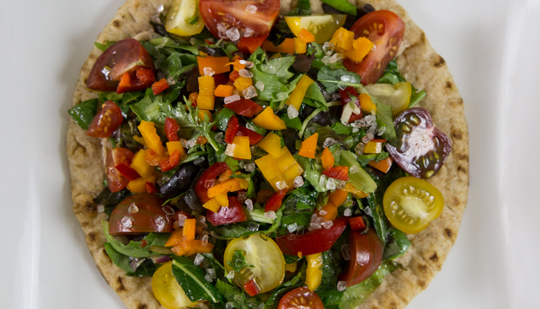 We strive to use the finest and healthiest ingredients in our Hearth Baked Flat Bread. While carefully chosen, there are some ingredients that may be a little harder to pronounce, such as Calcium Propionate (a salt), Mono and Diglycerides or Sodium Stearoyl Lactylate (derived from Stearic Acid) which are all used to help in the mixing of many baked goods and some dairy products or, to increase shelf life by maintaining freshness. Glycerides and Stearic acid can be derived from either vegetable or animal fats. Special certifications from a third party institution would be required in order for us to honestly claim this product as Vegan. We use vegetable ingredients wherever possible, and while we only use suppliers that we wholeheartedly trust, such certifications would need to begin there and we have not yet begun that process. Thanks again for your question and please feel free to contact us directly or respond here if you have any other questions. Hi, I am just wondering if the wholesome wheat flat breads are vegan?, There isn’t any labeling on them whatsoever and I’m not sure of the sources of some of the ingredients . Please clarify this for me. Toufayan Wholesome Wheat Flat Breads are not vegan. For now, only our Gluten-Free Pita Chips are vegan, however, our bakers are working to create vegan recipes for you to try. Watch our certifications page to learn more about our line of healthy and delicious products – we’re always adding more! You can find the Flat Bread package labeling on the top right of this page, or on the retail packaging page, Flat Breads, where the nutritional information is listed as well. Ingredients: Stone ground whole wheat, water, vegetable oil, yeast, soy flour blend, dough conditioner, sugar, wheat gluten, salt, baking, powder and calcium propionate (added to maintain freshness).